The first work on the disc is Elegy, written in 1991 for the Coker-Manson Trio and scored for violin, cello and piano. It was written in memory of the composer's father and contains 'songs my father's male voice choir used to rehearse in our home in my pre-teenage years'. It is sparse work, thoughtful and serious in which fragments of lyric melodies, snatches of the dimly remembered songs, weave their way through the complex texture. Scots folk-music is evoked and hinted at, but this is folded into a texture all of McGuire's own which has a robust sense of purpose and intense seriousness. There is a sense of memory about the piece, but though an Elegy it is never maudlin. Euphoria was written in 1980 and first performed by Peter Maxwell Davies and the Fires of London at the Edinburgh Festival. The work's title comes from a play by the Scottish writer, Marianne Carey and McGuire's initial plan was to link each of the seven sections of the piece to characters from the play. It is scored for violin, cello, flute/piccolo/alto flute, clarinet/bass clarinet, piano and percussion (marimba, temple blocks and bamboo wind chimes). It starts as a perky, mosaic-like texture full of delightful energy and humour. Stravinsky of the Soldier's Tale is clearly an influence, but throughout McGuire plays delightful games with the different textures of the music and combinations of instruments, percussions and such. At one point we whirl briefly into what sounds like a cèilidh. String Trio, written violin, viola and cello, dates from 1986 and was premiered by the Nash Ensemble at Bracknell's Wilde Festival. Premiered in the Summer of 1986, the composer talked of it having 'a suitable seasonal feel' but it is a very varied and temperamental Summer. It starts with a serious, intent sustained texture disturbed by just occasional flurries, developing moments of anger and energy. There are echoes of minimalism at times, and a Scots tune heard in the distance as if a cèilidh was taking place next door whilst something intense was happening closer to hand, we also get an element of Salm, Gaelic psalm singing with its unstructured texture based on multiple voices improvising on a single melody. Finally, aetherial harmonics lead to quiet stasis. 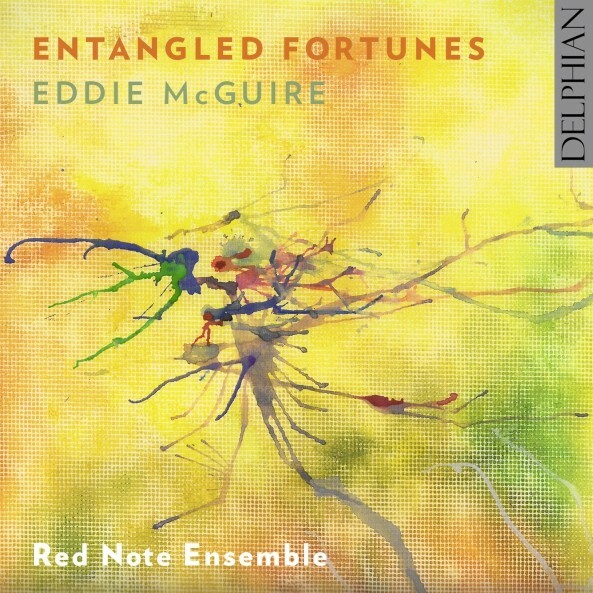 Entangled Fortunes which gives the disc its name is for violin, clarinet, cello and piano, was commissioned by the wife of Sir James Mirrlees, Emeritus Professor of Political Economy at Cambridge. It was performed, with music by Peter Maxwell Davies, Alexander Goehr and John Woolrich, at a gala concert her husband hosted at Cambridge in 2002. The work was inspired by aspects of Sir James Mirrlees work in political economics. McGuire gives the four instruments distinct, interweaving lines. There is a serious of intent here, and the source material gives no hint of Scots music. But despite the seriousness, it is skittish at times and ends in a highly rhythmic fashion, almost a jazz tango. Quintet 2, for violin, cello, flute, clarinet, piano, was commissioned by Lontano who performed it in 1987. It begins in quiet, intense fashion full of cries and whispers and McGuire said it 'marked a return to more dramatic, atonal music in contrast to my first Quintet (1989)'. Throughout McGuire uses the instruments in a mosaic-like texture and the results get very, very intense. 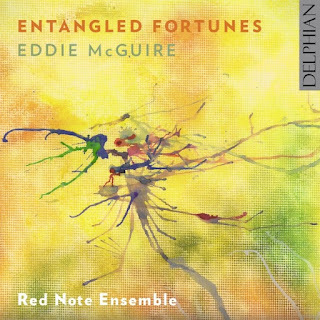 Throughout, the music gets extremely fine performances from Red Note with great intensity of purpose and a clear sympathy with Edward McGuire's idiom, creating some highly beautiful textures.